The 17th-century English bibliophile, Robert Cotton, sometimes bound together separate manuscripts which were otherwise totally unrelated, creating books of miscellaneous contents, this book being a good example. 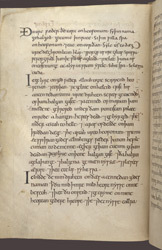 It is made of an early 12th-century English scientific textbook and an 11th-century pontifical (manual of services conducted by a bishop), some parts of which were probably made in France but which are bound with sections which clearly were made before the Norman conquest in Southwest England, probably at Sherborne Abbey in Dorset, where other additions in Old English and Latin were made. The monastery of St Mary, Sherborne, is mentioned in a form for a monk's profession of his vows, and later in the century the pontifical went to Salisbury after the see of Sherborne was removed in 1078 where it was updated further with instructions for Salisbury services. Prayers in Old English were added to the pontifical by at least two scribes. The prayers begin on this page, which is the back of a page of the pontifical, and continue on six pages which had been left blank. The first prayer, at the top, is the Lord's Prayer, the Creed follows it, and a third prayer begins near the end of the page. Earlier books made for bishops, such as the 9th-century Book of Cerne, had the character of prayerbooks, serving private devotional needs aside from providing instructions and prayers for services.